Alcohol dehydrogenase (ADH) is an enzyme. Since then, there has been extensive research on the enzyme.Alcohol dehydrogenase is a dimer, weighing 80 kDa. Alcohol dehydrogenases (EC 1.1.1.1) are a group of seven dehydrogenase enzymes that occur in many organisms and facilitate the interconversion between alcohols and aldehydes or ketones with the reduction of NAD+ to NADH. See Blood alcohol content for rates of metabolism. In the presence of ethanol, alcohol dehydrogenase I (AHH I) is induced and alcohol dehydrogenase II (ADH II) is repressed. ADH I and ADH II have molecular weights of 39,000 and 36,000 respectively. At least ADH I is under the control of alcR, a transacting regulatory gene that is adjacent to alcA (the structural gene for ADH I, Pateman et al. 1983). Mutations in the alcR regulatory gene result in non inducibility of ADH I specific mRNA. Extreme alcA and alcR mutations result in derepressed levels of ADH II, and it is not clear whether alcR controls ADH II directly or through its control of ADH I synthesis. Both enzymes are subject to carbon catabolite repression. Induction of ADH I and ADH II operates at the level of synthesis or processing of mRNA. The regulation of mRNA production for the yeast positive activator ADR1, a gene required for the expression of the glucose-repressible alcohol dehydrogenase (ADH II), was studied. ADR1 mRNA levels did not vary when yeasts were switched from glucose- to ethanol-containing medium, while ADH II expression increased 100-fold. The mRNA for the ADR1-5c allele, which augments ADH II expression 60-fold during glucose repression, was not present in greater abundance than ADR1 mRNA. the ubiquitin–proteasome pathway plays a role in the degradation of ADH and in the enhanced degradation of this enzyme by DHT. The ADH class I forms constitute the classical enzyme responsible for the liver ethanol metabolism, whereas the ADH class III form is a ubiquitous glutathione-dependent formaldehyde dehydrogenase. Both these classes are well established in structure, variability, internal architecture, origin, and function , with class III as a probable ancestor and class I reflecting a duplicatory emergence at early vertebrate times . ADH class IV exhibits a unique epithelial tissue distribution and is the characteristic stomach ADH, where it has been suggested to function in the first-pass metabolism of ethanol (7). More importantly, however, class IV has been ascribed a special function, based on its high activity with retinol , in the regulation of retinoic acid formation and hence in regulation of cellular growth and differentiation in vertebrates. The substrate is coordinated to the zinc; and this enzyme has two zinc atoms per subunit. One is the active site, which is involved in catalysis. Alcohol dehydrogenase is also involved in the toxicity of other types of alcohol: for instance, it oxidizes methanol to produce formaldehyde and ethylene glycol to ultimately yield glycolic and oxalic acids. Humans have at least six slightly different alcohol dehydrogenases. All of them are dimers (consist of two polypeptides), with each dimer containing two zinc ions Zn2+. One of those ions is crucial for the operation of the enzyme: it is located at the catalytic site and holds the hydroxyl group of the alcohol in place. The most important form of gastric ADH is isoenzyme of class IV, less important is the isoenzyme of class III. ADH classes I and II seem to have no role in the stomach. Alcohol dehydrogenase 7 (class IV), mu or sigma polypeptide, also known as ADH7, is a human gene. 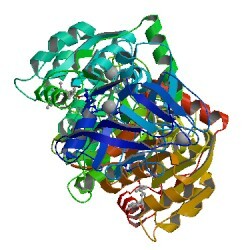 This gene encodes class IV alcohol dehydrogenase 7 mu or sigma subunit, which is a member of the alcohol dehydrogenase family. thus it may participate in the synthesis of retinoic acid, a hormone important for cellular differentiation. Varies between men and women, between young and old, and between populations from different areas of the world. The level of activity may not only be dependent on level of expression but due to allelic diversity among the population. These allelic differences have been linked to region of origin. For example, populations from Europe have been found to express an allele for the alcohol dehydrogenase gene that makes it much more active than those found in populations from Asia or the Native Americas. This may be a correlating evolution with the rise of aldehyde dehydrogenase, which has been suggested as one of the more recognizable recent evolutionary changes in humans (along with lactose tolerance) - in order to make water safe in cities too dense to use springs, Europeans fermented alcoholic (and hence antiseptic) beverages, while Asians typically boiled their water (creating, among other things, tea). This selected for those who didn't suffer from violent alcohol flush response in European populations. To examine the association between ADH1B, ADH1C, and ALDH2 polymorphisms and head and neck cancer, we undertook a pooled analysis of all relevant studies.